Thucydides made clear long ago the absurdity of expecting morality in the conduct of foreign relations. But, at the same time, in the debate on the Athenian attack on Mytilene I think it was, he also indicated why so much attention is paid to moral questions. In essence one needs to win the support of others who do not have self-interest at heart, both other countries and also inhabitants of one’s own country who might have different views. All this suggests some basic ground rules for countries that are in danger of being victimized by more powerful countries. The first is, do not provide any reason for pretexts to harm you based on morality. Second, since countries are adept at finding pretexts in pursuit of their own interests, make sure that you have enough support from other countries to deter potential aggressors. Third, ensure that the real motive behind any possible aggression will not achieve fruition, and that aggression will in fact have negative results. Of course following these rules will not always help. What happened with regard to Iraq is a case in point. Pretexts can be created out of nothing, as with the story about Weapons of Mass Destruction. Sadly, countries bent on action can be ruthless even with their own when it comes to such pretexts, as poor David Kelly discovered. Then, when there is sufficient determination, support from other countries will count for nothing, as happened when the United States decided to go ahead with the invasion of Iraq even when it became clear that the Security Council would not authorize this. However, it should be noted that the United States would probably not have acted on its own, but fortunately it had New Labour in attendance in Britain. Finally – and this is perhaps saddest of all – the judgment of potential aggressors is so often so askew that they will ignore any evidence that suggests their actions will be counter-productive. Also, once aggression starts, it takes on a momentum of its own, so that projected positive results are often lost sight of. It is those with the strongest motivation that triumph, and this is why the rent seekers in the American administration ended up dominating the post-war situation in Iraq, with concomitant drawbacks for long term international relations outcomes. Whether President Obama, who did not share such motivations, will be able to make a difference remains to be seen, but I doubt it for he is easily subjected to pressure by those who have different perspectives. 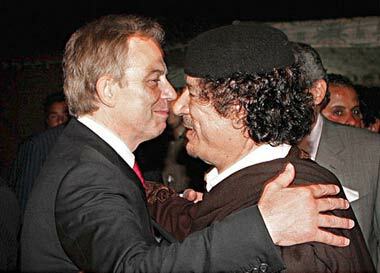 With regard to Libya, it is clear that the Gaddafi government did not have even as much international support as Saddam Hussein did (which perhaps also serves to make it crystal clear that morality has nothing to do with anything). It is also apparent that the actions of many Libyans, including some members of his government, provided understandable if not unquestionably justifiable reasons for intervention. And the military responses of his government set the seal on those reasons. 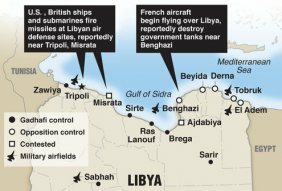 It was obviously not enough to hope that similar reactions by other countries that would never be attacked would protect him, partly because no one in a decision making position is interested in such comparisons, and party because the scale of operations in Libya suggested more serious problems. Finally, the Libyan government has not managed to suggest that any alternative would lead to a much worse situation for potential aggressors. The Mubarak government in Egypt managed to stave off change for a long time on these grounds, and other governments in North Africa have benefited from similar perceptions. 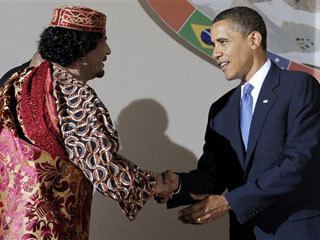 However in many of these situations there has emerged what can be characterized as a democratic and comparatively secular opposition, which may ensure a positive outcome for those who find the Gaddafi government unpalatable. How all this will work out remains to be seen, though it may be useful to look back at the history of many of these countries and the general picture with regard to Arab nations, democracy and regime change. That however will require a separate article. 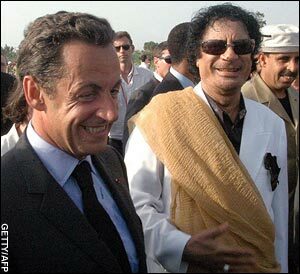 For the moment, perhaps Colonel Gaddafi himself will be reflecting on the irony that domestic opposition, which provides a preferred option to the West, began to develop only after he repaired his relations with his former detractors. On the one hand this might be the result of a thrust for reform that was unavoidable, given the manner in which an educated middle class has developed apace in countries such as Libya. However, he might also think that his acceptance of what might be termed a more modern programme was a mistake, and that to have continued with a determinedly hostile stance would have served him better. My own view is that reform of some sort was essential, and the Gaddafi government was right in modernizing and adopting a more open approach. But I have no doubt that other governments (and there are plenty, with divergent international alliances) which have obviously authoritarian systems (with more or less indulgence from others for reasons that have nothing to do with their political structures) will be wondering about what triggered the changes in Libya.